The visit by Chinese state councillor Madame Liu Yandong marks an important advance in China's relations with Northern Ireland. It is a measure of the significance of relations between China and Britain, where Northern Ireland forms a core part of the UK. Northern Ireland is small in terms of area, but it is famous in China and around the world for its unique cultural heritage. Over the last three decades, China has come a long way on the economic and social fronts. We owe our achievements to reforms. At the same time, we feel strongly that, without a stable environment, nothing can be achieved. I believe the people of Northern Ireland share this view. Now thanks to growing stability, Northern Ireland and China are being drawn closer to each other. Many Northern Ireland companies do business with China. Seven have opened offices there. Northern Ireland's exports to China, though modest, are growing fast. In 2011, exports to the BRIC countries (Brazil, Russia, India and China) increased by 30%. China was the largest market. This was all the more commendable against the backdrop of the international financial crisis. The indigenous music and dance of Northern Ireland, its wealth of history and culture and its gorgeous natural landscape, have already attracted tens of thousands of Chinese people. More than 1,000 Chinese students are studying in Northern Ireland. I was delighted to learn that Queen's University launched its Queen's Science Bridge Awards aiming to promote China-UK co-operation in sustainable energy and environmental conservation. Some of the research results are reported to have been applied in the construction of China's Hangzhou Bay bridge. The University of Ulster will also open the first Confucius Institute to boost Chinese language learning here. The Confucius Institute will be unveiled by Madame Liu Yandong. Northern Ireland is the first stop of her five-day visit to the UK. Tomorrow, she will visit the University of Ulster, Queen's University, and witness the signing of bilateral agreements on educational co-operation. State councillor Liu's diary also includes meetings with the First and deputy First Minister. On top of that, Madame Liu will have a chance to experience unique Northern Ireland culture. Relations between Northern Ireland and China are a reflection of growing China-UK relations. This year marks 40 years of full China-UK diplomatic relations. China and Britain have frequent exchanges of high-level visits. On the business front, China-UK economic co-operation is surging. China has become the UK's largest export market in Asia. Just as important, Britain is a top priority for Chinese companies investing in Europe. Some 120,000 Chinese students are studying in the UK. There are now a total of 19 Confucius Institutes and 60 Confucius Classrooms around the UK. No other European country can compete in this regard. The core purpose of state councillor Liu's visit is to launch the 'high level people-to-people dialogue'. This is an initiative aimed at deepening mutual understanding and trust between the two peoples and advancing China-UK co-operation in education, culture, science and technology. Opportunities for China-UK relations are also opportunities for China-Northern Ireland relations. I am happy to learn that First Minister Peter Robinson and deputy First Minister Martin McGuinness plan to visit China later this year. They will be made most welcome. As I write, spring has come and flowers are in bloom. 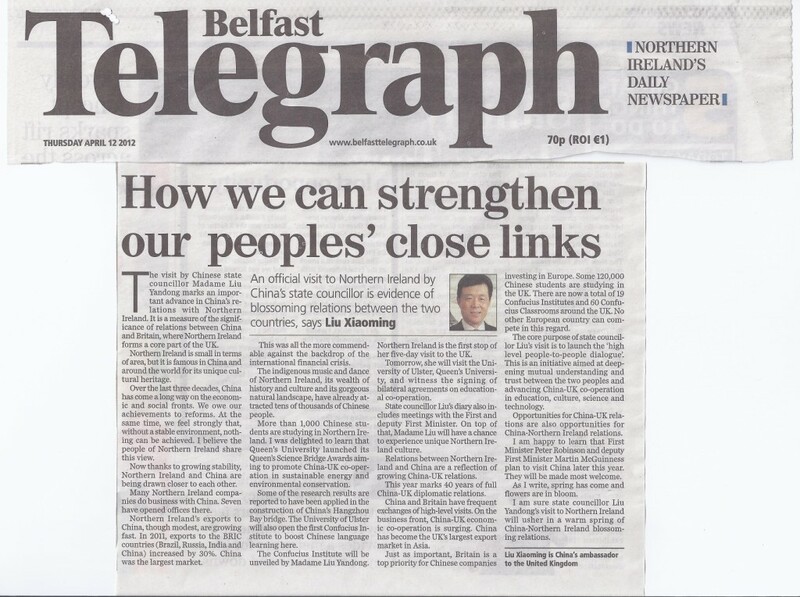 I am sure state councillor Liu Yandong's visit to Northern Ireland will usher in a warm spring of China-Northern Ireland blossoming relations. Established in 1870, The Belfast Telegraph is the largest newspaper in Northern Ireland, UK, with a daily circulation of 66,000.